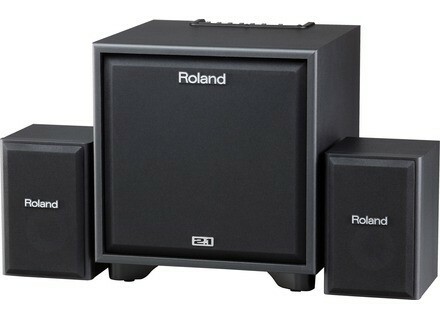 CM-220, PA Package (Sub + Satellite) from Roland in the Cube Monitor series. 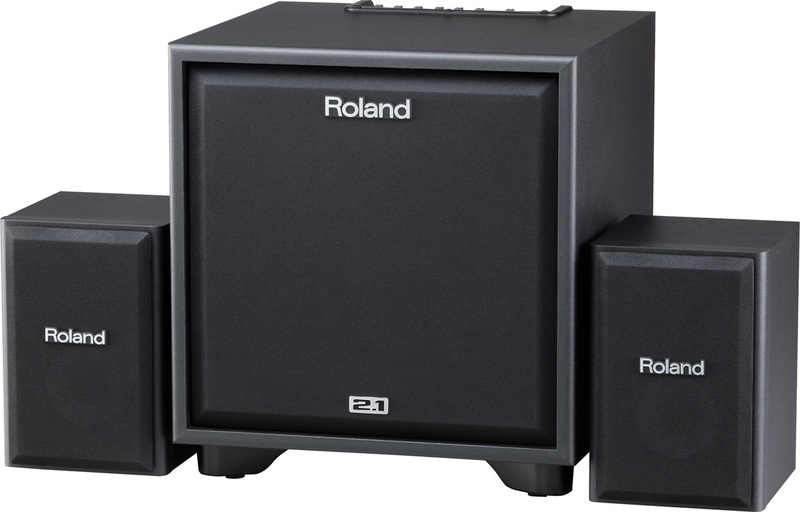 Roland introduces the CM-220 and CM-110 CUBE Monitors, two portable 2.1 speaker systems for playing, practicing, and recording musicians. Outfitted with two satellite speakers, a subwoofer, and multiple stereo inputs for electronic musical instruments and other devices, the CM-220 and CM-110 systems are suited for practice spaces, personal studios, family music areas, intimate performance settings, and more. Featuring custom-made speakers and integrated amplifiers, the CM-220 and CM-110 systems are designed to deliver full-range sound for electronic musical instruments and music playback. A built-in protection circuit is designed to guard against excessive signal levels from electronic musical instruments that produce a wide dynamic range, such as synthesizers and V-Drums electronic percussion. In each system, an active subwoofer houses the amplification system for the passive satellite speakers, as well as connectivity options for various types of multimedia devices. The multiple stereo inputs include ¼-inch instrument jacks, RCA and 1/8-inch mini jacks, and a coaxial S/P DIF digital jack. A built-in three-channel mixer provides independent volume controls, global high and low EQ, and volume controls for master and subwoofer levels. In addition, XLR/TRS balanced jacks are provided for sound expansion via an external mixer. The CM-220 is a 200-watt system, with 100 watts of power for a 10-inch subwoofer and 50 watts each for two satellite speakers. The CM-110 is a 100-watt system, with 50 watts of power for a 6.5-inch subwoofer and 25 watts each for the satellite speakers. In both systems, the satellite speakers are two-way designs with 4-inch midrange drivers and ¾-inch tweeters. The optional ST-CMS1 Monitor Speaker Stand is suited for use with the satellite speakers in a CM-220/CM-110 system, providing operation with steel legs and a height-adjustable center pipe. The CM-220 and CM-110 CUBE Monitors will be available in April 2012. [NAMM] Studiomaster Acoustic Image Panels The Acoustic Image4 and Acoustic Image6 (passive) and Acoustic Image4A and Acoustic Image6A (active) exploit NXT technology developments.